Ta’am, Prestwich – Great food.. Anyone for coffee? Not here! We met our friends for dinner at Ta’am a local kosher restaurant located in Prestwich. I’ve been meaning to go there for ages.. It was like watching the build of a never ending development… every time I passed it in the car, on the busy main road, it had building work going on. But not anymore… in fact it’s been open for ages. This incredibly busy place, located right next to a well known mobile phone retailer, is humming with its takeaway counter and trendy eating areas. The tables and walls have a cabin like feel, with look alike planks of wood. 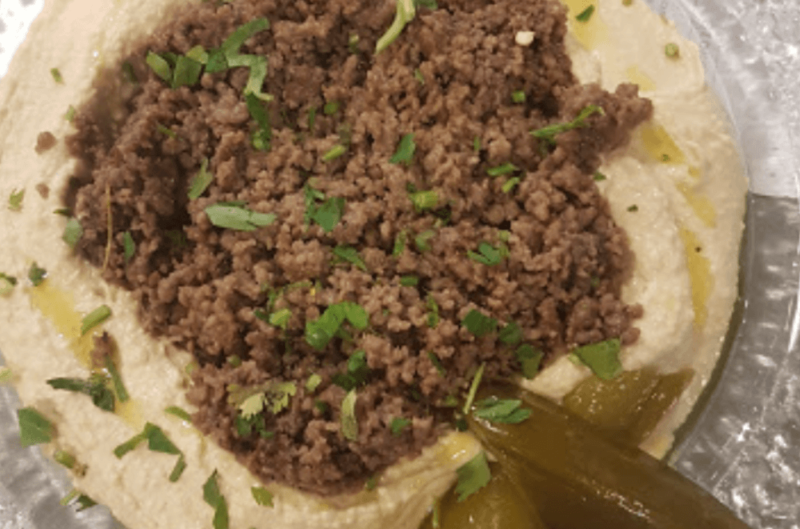 You come here for middle eastern kosher food … and you’ll not be disappointed. We started with a hummus and lamb dish.. delicious! It was huge for two people and so I’m glad we ordered just one between four of us. For the main course my wife had the Salt Beef, whilst I went for Ta’ams Schwarma, which I thoroughly enjoyed, accompanied by sweet potato chips and salad. In fact … it was all going great until we asked for hot drinks. Well that deflated the end of a nice meal! I think this is the very first restaurant I have ever visited where they don’t serve hot drinks. Forgetting my needs.. it certainly meant they lost out on the additional income they could have gained from most clients. I’ll be back to Ta’am though because we did enjoy the food, but unlikely for a special occasion… but then, it was that busy.. I doubt they’re waiting for us!